This is just…too…random. It’s OK that Waffle House talked about something other than waffles. 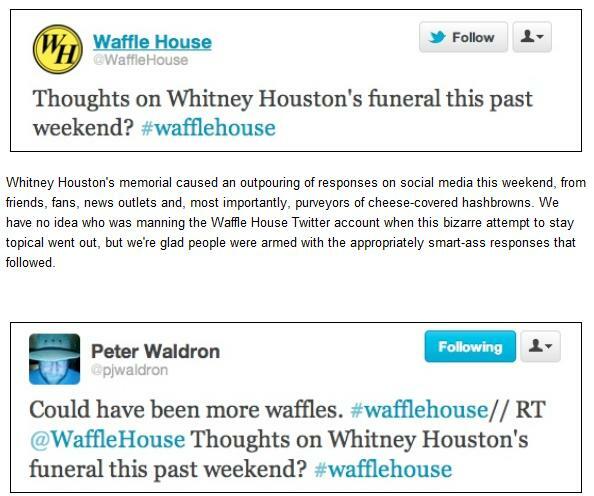 It’s not only odd they chose to talk about Whitney Houston’s funeral, but it’sreally odd that they then tagged it with #wafflehouse. Just because it’s relevant, it doesn’t mean you have to tweet it. Miss Chris · A work in progress…but isn't everything?